This past saturday I was invited to s bachelorette party but was prevented due to other activities that day. It was asked if anyone could bring a cake for the afternoon coffee and even though I has other plans for that day, I volunteered. 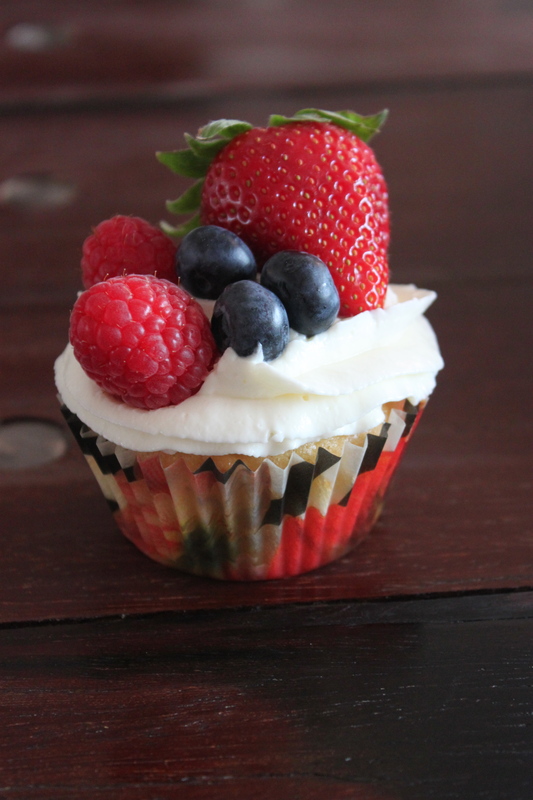 I decided to make these cupcakes filled with Amedei Toscano White and raspberries, as I find it to be the perfect summer cupcake and we truly need to see some summer here in Scandinavia soon!! combined flour, baking powder and salt in another mixing bowl. Add the flour mixture to the butter and eggs mixture alternating with the buttermilk. Scrape the sides of the bowl again, if necessary. Add the lemon zest and the chopped white chocolate, and fold until evenly combined. When I want you to fold and not whisk, it is to make sure that the batter keeps the fluffy consistency it got in the last step. If you over-whisk, you’ll risk to loos the fluffiness and the cupcakes will get heavy. Line standard muffins tins with paper liners. Fill each paper line with 1 tsp. of the batter. divide the frozen raspberries in the middle of the batter. Then divide the remaining batter on top of the raspberries and bake at 400F for approximately 18 minutes or until a toothpick comes out clean. Place all three ingredients in a mixing bowl and whisk until smooth and fluffy. Put the frosting in a piping bag with your favorite piping tip (this one is Wilton M1) and decorate the cakes. 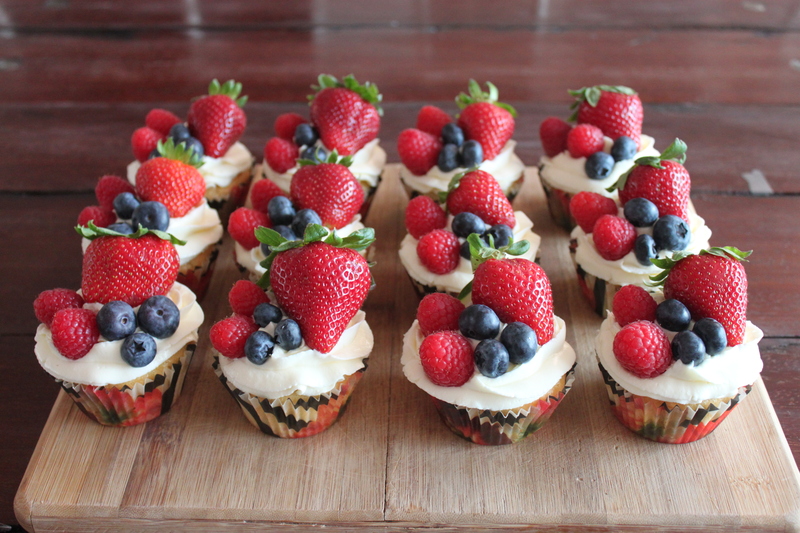 To finish of the cakes, decorate with one strawberry and two raspberries and blueberries. Serve in the afternoon with a great cup of coffee or as a dessert with a glass of sparkling wine. 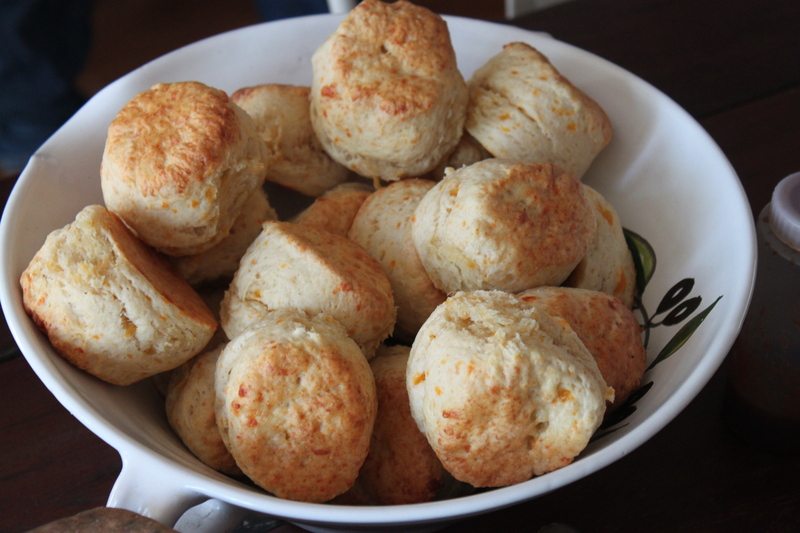 This id our third post on biscuits and we can assure you that it won’t be the last 😀 The basic recipe is a Southern biscuit to which we all all kind of ingredients like e.g. cheddar, rosemary, thyme or as this time jalapeños. In a large mixing bowl, sift together flour, baking powder, salt and sugar. Cut the butter into the dry ingredients and whisk until the mixture resembles coarse crumbs. Add the chopped jalapeños and whisk again. Beat 2 of the eggs slightly and add to the mixture together with milk. Knead until just combined and it has a sticky and moist texture. 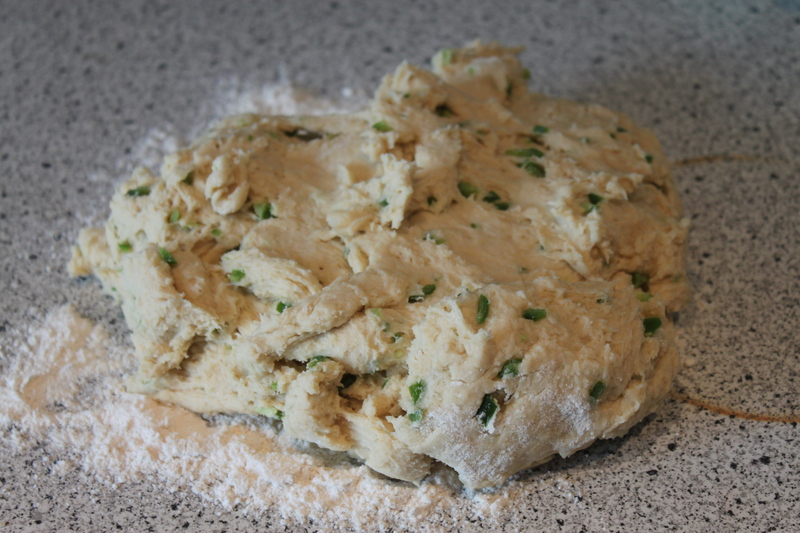 Place the dough on a slightly floured surface. Knead until smooth. 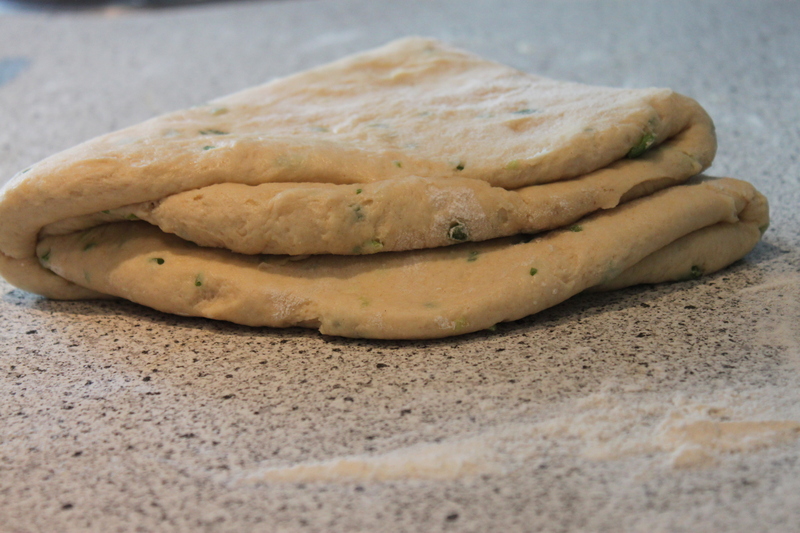 Roll out the dough to about 1/2 inch thickness. Fold the dough halfway over and roll again. Do this 4-5 times. Be careful not to roll all the air out of the dough. Cut the biscuits with a 2 1/2 inch cookie cutter. 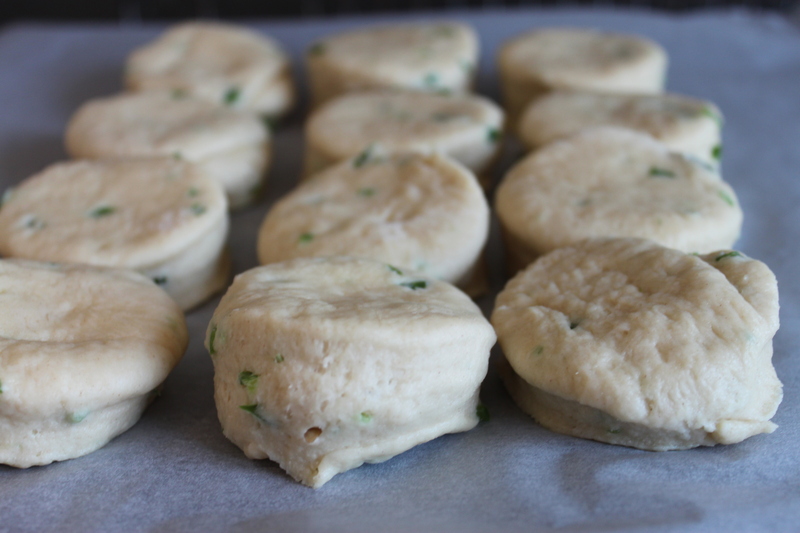 Place the biscuits close together on a piece of baking paper. Beat the last egg slightly and brush the top of the biscuits. Bake at 400F for about 18-20 minutes or until the tops are golden brown and a toothpick comes out clean. 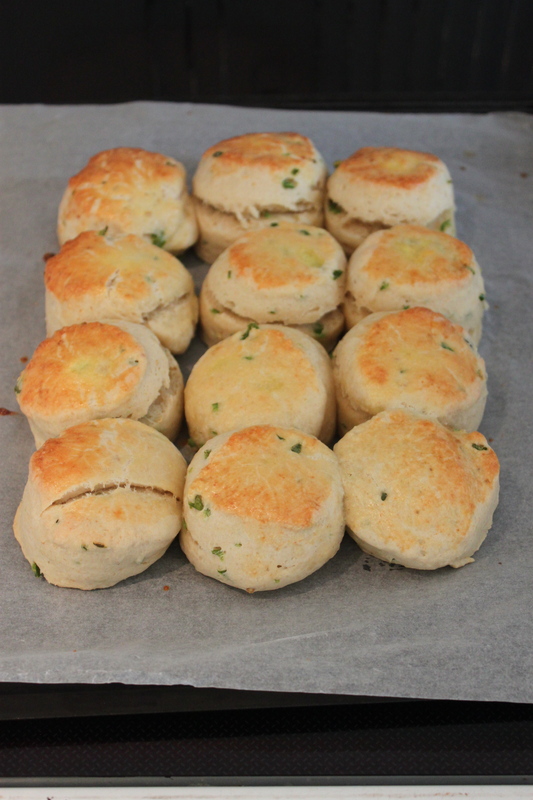 Biscuits, biscuits and more biscuits…. We both love biscuits and we make then quite often. Sometimes because they are the best choice for the food served and other times, because we have forgotten to by/bake some bread and don’t have the time to wait for the dough to raise. In a large mixing bowl, sift together flour, baking powder, salt and sugar. Cut the butter into the dry ingredients and whisk until the mixture resembles coarse crumbs. Add shredded cheddar and whisk again. 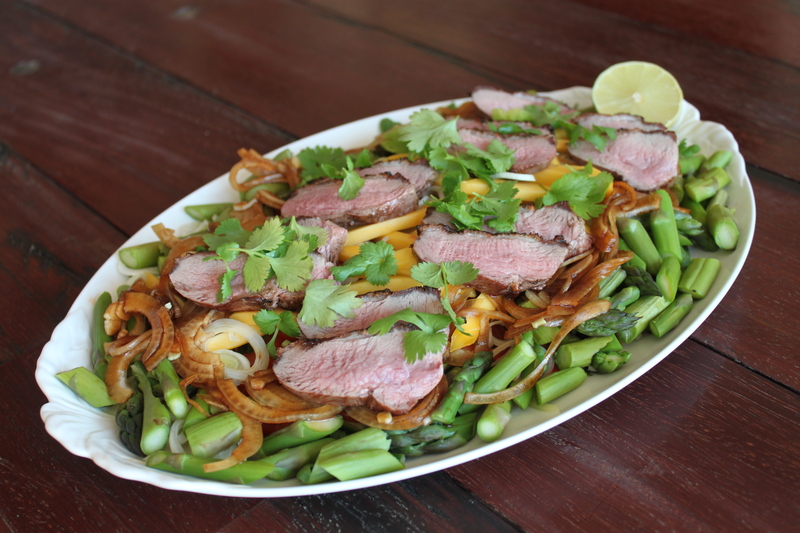 The recipe is quite easy to follow and it doesn’t take long to make. 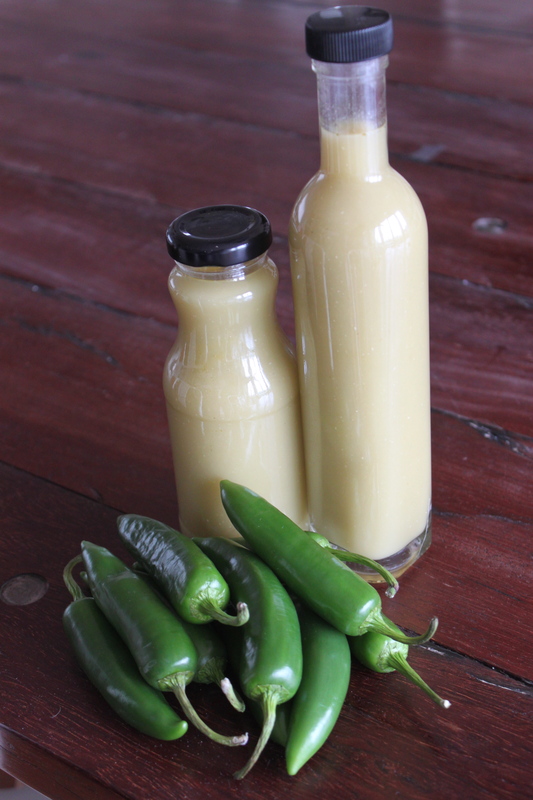 So do you have jalapeños leftovers after dinner, you can freeze them and when you have enough, you can make delicious homemade hot sauce to be served on top of tacos or to spice up your daily cooking. Have you used a properly cleaned jar, the hot sauce can be stored for up to 6 month in a cool and dark place (ours doesn’t last for more than a few weeks, as we looooove hot sauce :-D). 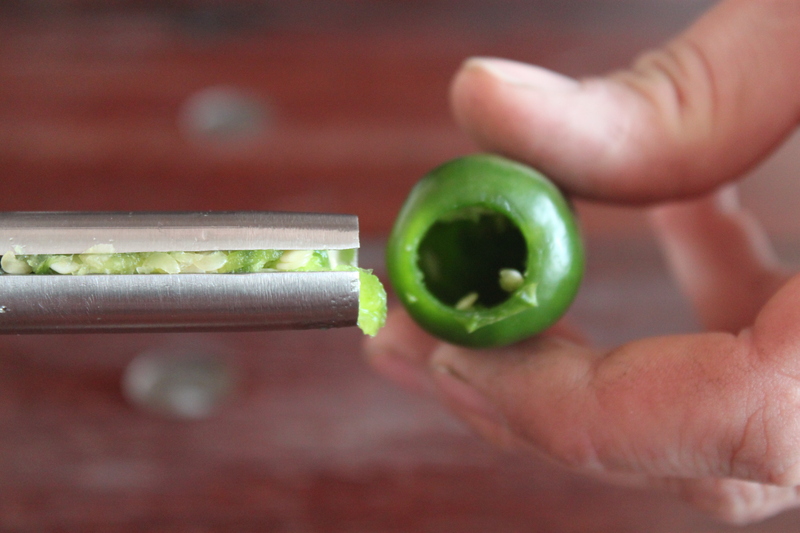 Remove the stem form the jalapeños and slice them (as described above, and as you can see the first picture, we have used all the leftovers from our chili cheese tops so we have only added 4 whole jalapeños). 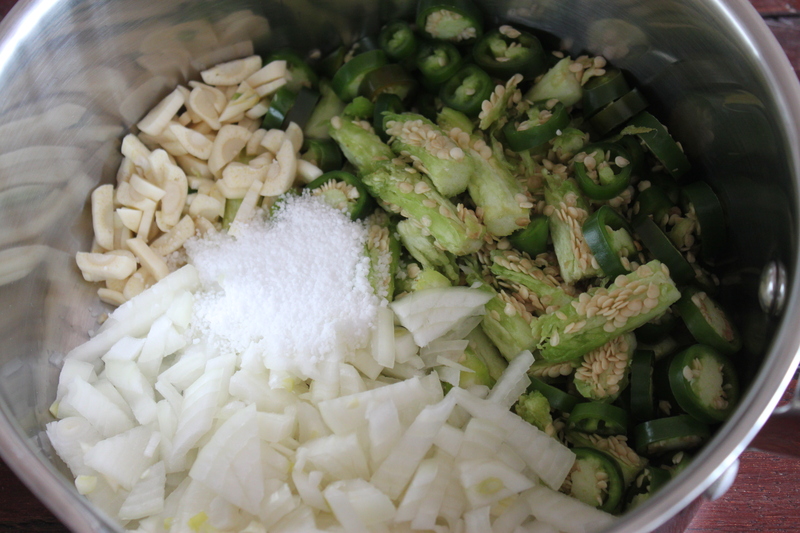 Chop the onion and garlic roughly and place in a sauce pan together with salt, jalapeños and water. 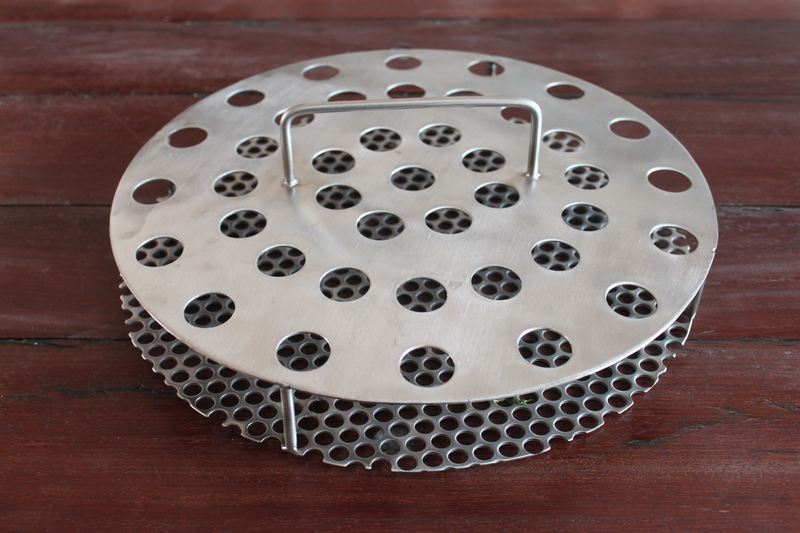 Bring to a boil and cook at medium heat for 20 – 30 minutes or until most of the water has evaporated. Stir occasionally to avoid burning. 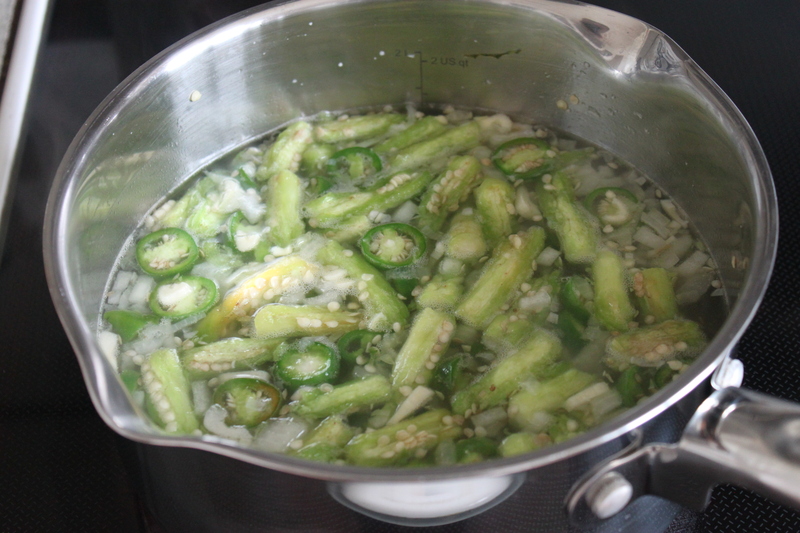 Remove the cooked jalapeños mix from the heat and let it cool a bit before transferring it to a blender. Use a rubber spatula to get all the chili mix from the sauce pan and into the blender. Blend on medium speed while slowly adding the vinegar. Scrape the sides of the blender if necessary. Blend for 2-3 minutes. Pour the chili sauce back into the sauce pan and bring to a boil again and cook for approximately 10 minutes or until the sharpness of the vinegar is gone. Depending on your consistency preference you have two options now: 1) you can leave it as it is now and transfer it to a clean jar, or 2) you can transfer the chili sauce through a stainer and into a cleaned jar. This is done to remove any small seeds that did not get blended completely. The difference between the two methods, is the consistency of the end result. Using the last method you will get a very thin hot sauce like e.g. 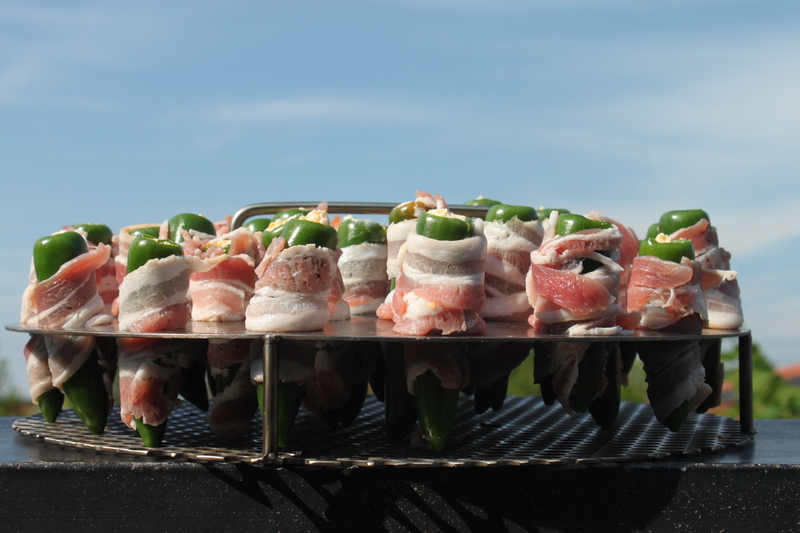 Tabasco, while the first methods gives a thicker and more grainy consistency. Guess what it is… GIVE-AWAY! 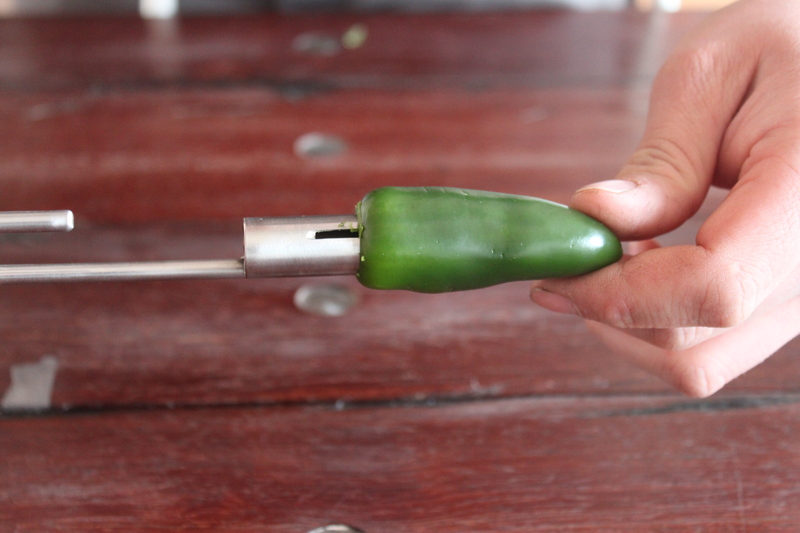 As you can see o the pictures below, the large round tool is a Chili Cheese Rack while the small long tool is used for getting the stem and seeds out of the chilies! As promised we made a random draw between all comments, and the winner is comment no. 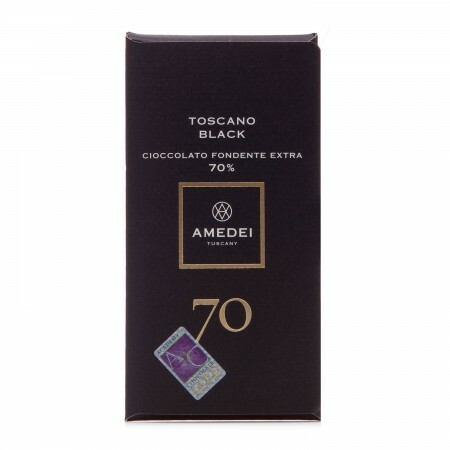 6, so congratulation to Susanne 😀 Would you please send and e-mail to foodondemant@gmail.com with your address and your chocolate preferences? As I wrote in the last post, it is Mother’s Day today. For my own mother I made baked rhubarbs with vanilla cream – delicious! These cupcakes was for my best friend mother. I have known the family since 1986 and they have always been as a second family to me, so I decided to bake a cake for the woman who always made me grilled cheese and who’s door has always been open to me – thank you Connie. Shift in flour mixture in four batches, alternating with the sour cream, and warm water and whisk until just combined. 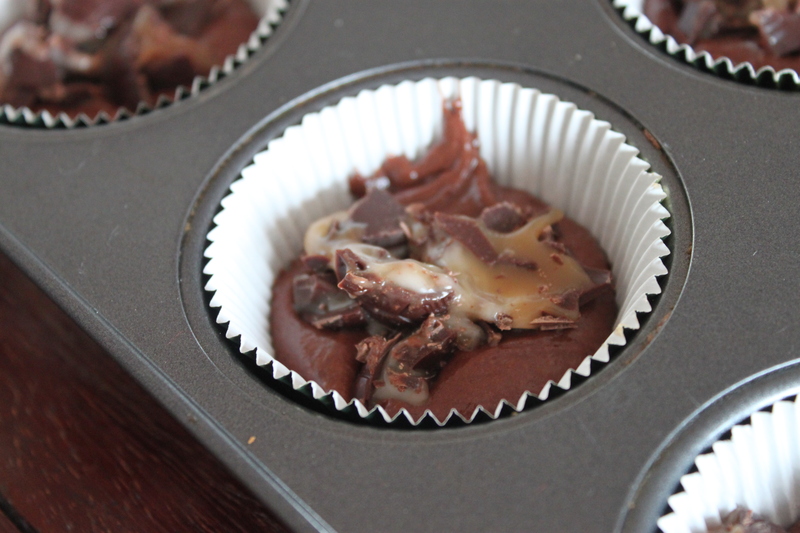 Melt the chocolate in a heat proof bowl, over a pan with simmering water. Add the melted chocolate to the batter and stir to combine. Line standard muffins tins with paper liners. Fill each paper line with 1 tsp. of the chocolate batter. Then chop 1 chocolate turtle at at time and lie in the middle of the batter. Then add another tsp. of the chocolate batter. 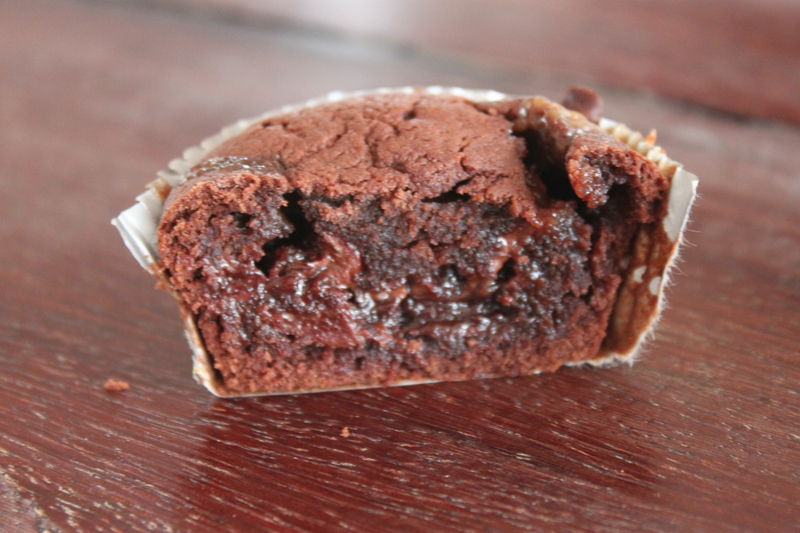 Make sure that the chopped turtle is fully covered with the chocolate batter. Place sugar, salt and egg whites in a heatproof bowl over a pan of simmering water. Stir until the sugar has dissolved. Transfer to a mixing bowl and whisk at medium speed until the meringue has reached room temperature. Cut the butter into small cubes and add a few cubes at a time to the meringue while whisking. Whisk until the buttercream is smooth and creamy – it takes 5-10 minutes. 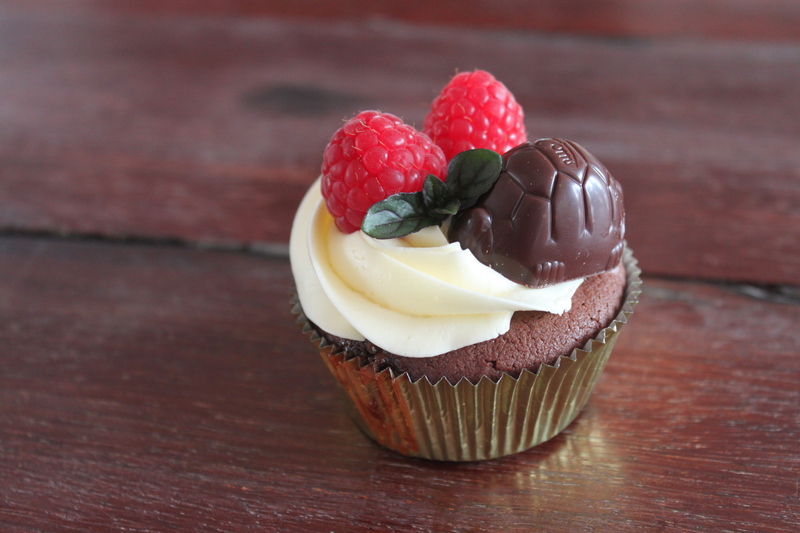 Decorate the cupcakes with buttercream and top it of with a chocolate turtle, 2 raspberries and a spearmint leaf.